Fans at Sunday’s football game at Richardson Stadium won’t be able to see any of the work that’s been done for the new facility these past six weeks. But they will be able to park on it. 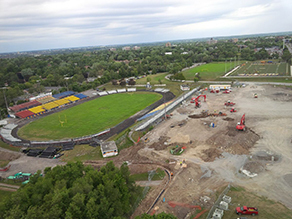 All people at the Ontario University Athletics season opener will see of the early work for the new stadium will be a pristine parking surface east of the current structure, some footings for the parking lot lights, and some excavation work underway at the southeast corner of the stadium. 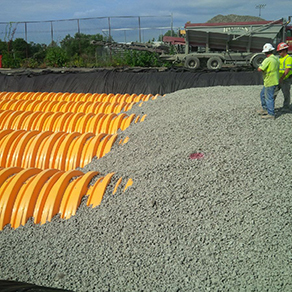 Underneath, all of the site services—sanitary and storm sewers, water works, electricity and communications infrastructure—have been put in place, ready to be connected to Richardson III, which is scheduled to be completed in time for the opening of the 2016 football season. Given that the Gaels realistically had no place to relocate for this year, when the final go-ahead was given for the project the decision was made to leave the team in the old place for another year, and get to work on the new stadium immediately at the end of the 2015 season. It was an imposing timeline—10 months to demolish the old structure and build anew, with three of those months a Canadian winter—but the university gave the contractor permission to do what it could as soon as the requisite municipal permits were in hand. Workers were on the site July 13. Though approval to build the new stadium wasn’t granted by the Queen’s Senate until last December, in anticipation of its inevitability Sullivan has been working on the project for three years. Garrah, who grew up in Portsmouth, in the shadow of the stadium—“I used to be one of the kids who cut the fence to get into the games”—said work will continue south of the field, into the south parking lot, to complete the north-south tie-ins for all the services. There won’t be any changes for the team or fans, though for Sunday’s game only the two east gates—to the student bleachers—won’t be open. 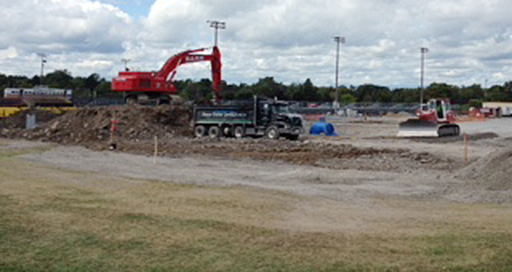 However, with the tennis courts gone, the parking lot will now hold more than 200 cars. “It’s close to being normal but not quite,” Garrah said. “You don’t ant to inconvenience anyone. They’re still living here. The parking lot is scheduled to be paved, Garrah said, but that work is being held in abeyance as a buffer against future unforeseen expenses. Tenders are open for the next two phases of the project: the 400-plus micro-piles that will, essentially, hold up the place, and construction of the grandstand. There are two grassy knolls on the east side of the field and nothing to the south of it, where the scoreboard will be, and Garrah hopes to get some work done in those areas before the snow flies. Sullivan said the co-operation among his company, the university, the city and sub trades is one reason the project is proceeding as well as it is. “People have realized that this is good for the community,” he said. “Everyone’s been super co-operative. That doesn’t always happen. One unique aspect of this project—among the company’s recent work are the new police station and the new medical building at Queen’s—is that virtually all of it is outdoors. Other than the east building, which will house washrooms, concessions and ticketing, there’s little opportunity to finish a building’s shell so work can proceed indoors during inclement weather. “We’ve researched it, we put our legwork in. Now we’ve just got to do it,” Sullivan said. “We are extremely concerned inside this office with schedule, but pressure makes diamonds and we’re going to do what we can. We’ve been in business for 101 years by not failing, so we’re certainly going to give it our best hook.